GE and its products are part of the American iconography. Its founder was Thomas Edison, one of America's foremost thinkers, inventors, and tinkerers. 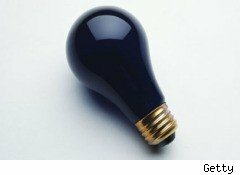 His invention of the light bulb in 1876 marked the moment of GE's genesis. If you can say that light bulbs capture the spirit of American ingenuity, you can also say that GE's soul is encapsulated in that inverted pear-shaped, "A-line" light bulb. Generations of Americans see the GE logo, in their mind's eye, on the round base of a glowing light bulb. On September 24, that classic American light bulb was switched off. Changing American preferences and looming government regulation resulted in the shuttering of the only remaining U.S. factory to make 100-watt A-line incandescent bulbs, in Winchester, Virginia. The bulbs are still being made in Monterrey, Mexico, but the empire of the classic incandescent light is in its decline. Over the past five years, says Kim Freeman of GE Appliances & Lighting, "the demand for these incandescent bulbs has declined by 50% -- and that's all customer preference." Educated by green media such as Greenpeace and, famously, Al Gore's takeaway in An Inconvenient Truth -- that the best thing viewers could do for the planet is to change their bulbs -- consumers are doing what the government is slowly asking them to do. In 2012, bulbs between 100 and 150 watts manufactured in the U.S. will have to be at least 30% more energy efficient; by 2014, bulbs between 40 and 99 watts will have to meet those new 30%-less standards. With current technology, incandescent bulbs can't do this -- at least not for a price consumers are willing to pay. So, at 8 p.m. last Thursday night, 200 employees were out of a job, albeit with more than a year of advance notice, and nice severance packages (benefits included one year of continued GE medical and dental benefits, as well as a lump-sum payment equal to seven or eight months' pay for those with 15 years of service, and early retirement for many workers). A decidedly political piece in the Washington Examiner had workers still angry, and blaming "a Democratic Congress" for making the regulations and accusing CEO Jeff Immelt of having "sold out" to President Obama. Freeman says that the shuttering of the Winchester plant "was very sad for all of us," but switched the message quickly to the way the company is honoring its light bulb-inventing founder. "Edison's history of innovation is a great foundation for us," she said, calling it "a very exciting time in the lighting industry as we look at new technologies -- as we change the way people light and think about the world." She went on to describe the many technologies GE is now producing or working on, such as new sorts of compact fluorescent bulbs, halogens, and LEDs, "very exciting and energy efficient!" Great, but, Kim, what about the iconography -- the incandescent light bulb as a symbol of the energy of our ideas? "The ideas have not quit coming," she assured. "The icon may take a different shape," she said, noting that the corkscrew shape of a CFL bulb was used in a local newspaper's coverage of a GE Idea event. And, "we do make CFLs in that shape, the A line bulb shape's not going away, it's a very popular shape with consumers." The way I see it, last Thursday's second shift at the GE factory in Winchester, Virginia marked the production of the Last American Light Bulb. I'm the sort of girl who would spend $5 for a light bulb, too, but the symbols of the spirit of innovation mean more to me than a few dollars in energy savings. I'm too stubborn to switch iconography just like that, Al Gore, or no Al Gore.